Ding Junhui hit another maximum break in 3 days after PTC12 two days ago. Congratulations to Ding Junhui for his fourth 147 in his career. Ding made this classy 147 during the fifth frame in his first round match against James Cahill. The second last black cut by rest was amazing and got the perfect angle for the last red. 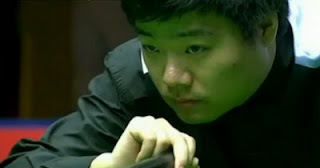 Ding successfully completed his fourth maximum to rank fourth on the history of making most 147s. He also created a record for the shortest time duration between two 147s, just three days. The maximum man went on to win all the three matches today including a 4-2 defeat over Stephen Hendry in the last 32. Ding will face the challenge from Anthony Hamilton in last 16 on Sunday. Dominic Dale could be called 'Killer of World Champions' today because he defeated Neil Robertson and Shaun Murphy in the first two rounds. However, Dale is unlucky to lose to Stephen Maguire in last 16 and failed to meet Mark Davis on Sunday. 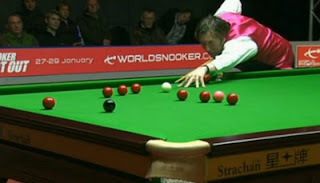 M. Davis kept his hope to replace Ronnie O'Sullivan in the Top 16 at the next cut-off point by entering the final 16. He needs a decent run in the PTC11 to get enough points for his hope. Michael Holt made it 13 consecutive victories in PTC series with three wins today. Holt will bump into Matthew Stevens who booked his last 16 place on Sunday despite being docked a frame for late arrival in his first round match. Martin Gould will play against Simon Bedford in last 16 on Sunday.